Welcome to our brand new showroom. After 15 years at our Great Western Road premises, we have now expanded and moved to Pit Lane, Mossland Drive, Hillington Park, Glasgow. We are continuing our award winning customer service throughout sales, after sales and our high standard of motorcycle servicing. We continue to supply for customers with genuine parts, accessories and our full range of technical and casual clothing and merchandise. Our brand new model range bikes are available to view, test ride and purchase from our brand new showroom, as well as immaculate condition previous models, pre-registered bikes and ex-demonstrators. We also have a dedicated used bike display area so we have something in store to suit everyone. We can buy your used bike from you, you can receive cash in return or use the bike as a deposit against another new or used bike. We also sell and display an incredible range of used bikes, with any make and model available. Our used bike floor is hosted on the upper level of our new showroom, and displays immaculate condition bikes. We don't settle for anything less. Almost all used bikes come with a 12 month warranty and we look after you and and our used bikes just as much as we do with our new Ducati's. In our brand new premises we have a dedicated Land Of Joy - a perfect piece of tranquillity full of the latest Scrambler models including the ever popular Desert Sled and the Cafe Racer. This area is like a mini-dealership, with Scrambler dedicated clothing, merchandise, as well as both new and used Scramblers. There's no better way to ride off into the sunset on your new bike than right out of the showroom, and now you can with Ducati Glasgow. We have purpose built a comfortable handover suite with an extra wide sliding glass door so you can leave the showroom on your brand new bike. Our Sales Team will dedicate this handover time especially to you, uninterrupted and undivided attention. Exactly what you would expect from the Ducati Glasgow family. The upper floor of our new showroom hosts our entire range of technical motorcycle safety clothing as well as casual wear. We supply both ladies and gents clothing, as well as kidswear and merchandise. We have stylish extra large fitting rooms with full length mirrors as well as highly knowledgeable retail staff on hand to assist with sizing, measurements and product guidance. Gift cards are also available. 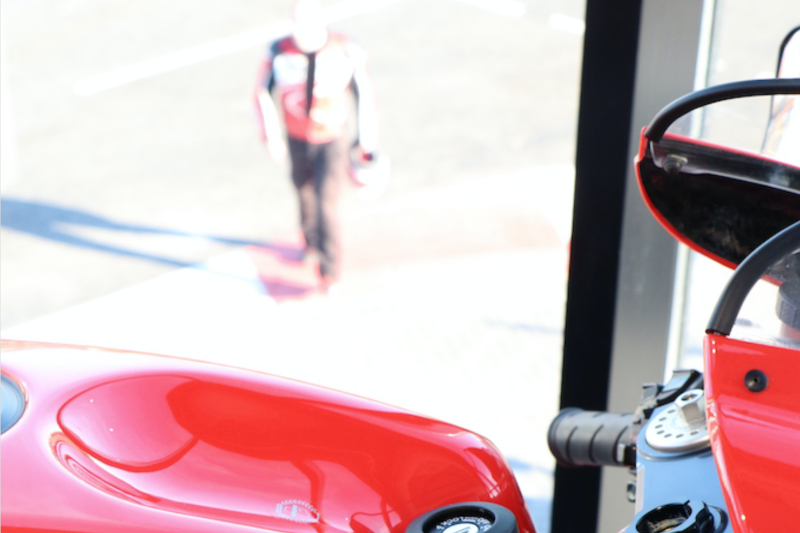 We want to ensure you get the correct part you require for your specific motorcycle. 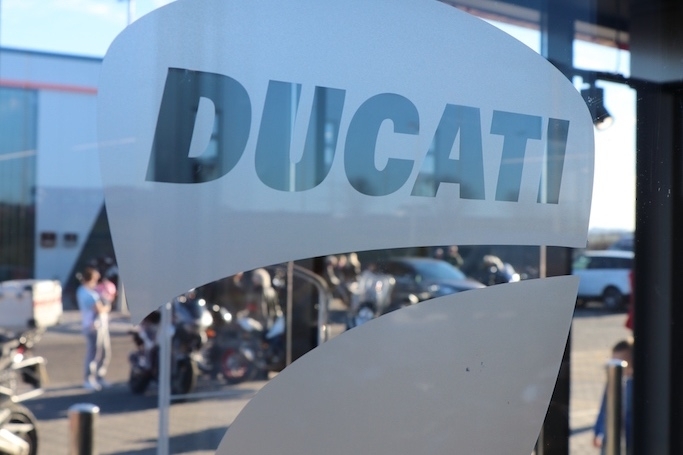 Our friendly and experienced parts team have years of expert knowledge and can advise, source and arrange delivery for genuine parts for the entire range of Ducati models. We also have a full range of tyres on display and a range of accessory kits in stock. Not sure what it is you are looking for? We can help with our expert adivce. Our factory trained Technicians can perform any and all operations required for your machine. On display you can see a wall adorned with just some of the certificates our Technicians have been awarded in recent years. A reassuring aspect when you entrust your motorcycle for essential servicing and maintenance. Whether it is a simple tyre change or a full service - our customers can watch from start to finish. To us, this is the ultimate demonstration of our trustworthiness and confidence. All of our factory trained Technicians have successfully completed VOSA and DVLA recognised and certified MOT Testing Training. Within our brand new workshop we have a dedicated 7 metre squared MOT testing bay with the latest brake testing equipment. We can MOT any motorcycle, not just Ducati bikes. You can have your motorcycle collected from your home or office within Scotland and returned to you for just £1 per mile each way. Our Dealer Support Vehicle can collect and deliver up to three bikes at a time, and our drivers are fully trained in manual handling, loading, unloading and securing any make and model of motorcycle. This is a coffee shop for bikers, friends of bikers, their friends and families and a comfortable, welcoming space for the local community. Not only do we serve hand roasted coffee, we also have dedicated shelves for helmets and gloves, jacket storage, sockets for you to charge your phones and sat-nav's, 2x Smart TVs with sports channels and live racing, smoking area and a sun facing balcony with outdoor seating.